If you’re concerned about your baby developing a food sensitivity or allergy, here’s what you need to know. Approximately six to eight percent of children age two to three years are allergic to one or more foods. The odds of developing food sensitivities increase if a child has a family history of what doctors call “atopic disease”—hay fever, eczema or asthma. Children with one allergic parent run about a 30 percent risk of developing some sort of allergy, including food allergies. Two allergic parents doubles a child’s risk. What’s the difference between “food allergies” and “food intolerance”? If your child has problems with or is sensitive to certain foods, they are likely allergic or intolerant to them. But “food allergies” and “food intolerance” are not the same thing. A food allergy is caused by an immune reaction. And while some allergies are mild, certain foods may trigger a severe reaction. These foods include peanuts, tree nuts, fish, shellfish, and, in some cases, milk and eggs. A food intolerance is different, and in many cases, the reason for the intolerance is unknown. See your family doctor if your child has lost weight or has bloody or mucousy stools. If your child has had a reaction to a specific food, he or she should be referred to a qualified allergist or immunologist. The specialist will investigate and determine whether the reaction is a food allergy or intolerance, and suggest ways to modify risk factors and develop a management plan. Many experts believe that delaying the introduction of certain foods until a baby’s immune system is more mature may fend off some food allergies. Consequently, most physicians recommend breastfeeding exclusively for six months and switching to formula if you wean before a year. 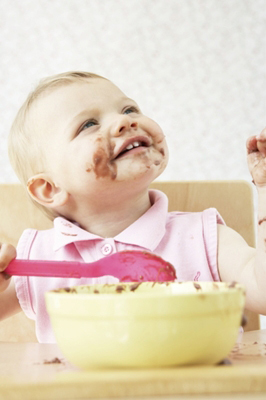 In some instances, your child may have bloating, diarrhea, gas or a rash after eating a particular food. Alternatively, your child may lack an enzyme such as lactase, and will react to a food that contains lactose, such as milk. In this case your doctor may recommend lactose-free milk or lactase tablets. Even if neither you nor your partner have a history of allergy, most health professionals now advise waiting to introduce the foods most apt to cause allergies. How do I know if my child is having allergic reaction? Some children may have a life-threatening reaction called anaphylaxis. An anaphylactic reaction involves difficulty breathing, or may cause a sudden drop in blood pressure and may lead to unconsciousness or death. Since the first sign of anaphylaxis can be mild and resemble any of the above signs, emergency treatment is critical. If allergies run in your family, consult your doctor for individual recommendations.